I was just about to write a post about how much I am in love with Cams Cords right now, and I saw that the daily prompt is Anticipation! I am indeed anticipating a package from Cams Cords. They have a great selection of paracord and accessories. I’ve just ordered a bunch of cord and buckles and not only am I anticipating their delivery, but I’m excited about foisting this new found obsession on my whole sailing camp in three weeks! 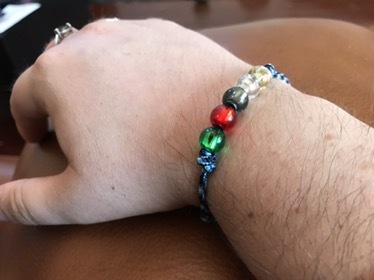 You see, I have been part of a sailing camp for children in school years 4-6 for many years, and I decided for craft this year we will make paracord bracelets! One of the bracelets will have beads and then they can make another in a different style if they like. The beads arrived on Wednesday, so I made a prototype. I’m happy with how it came out. I like the double overhand knot to secure the beads and my sliding knots came out well. I did a sliding knot that I remembered from when I was a kid, it’s like the hangman’s knot, but a bit different. I think we’ll probably use buckles with the kids though… We’ll see!